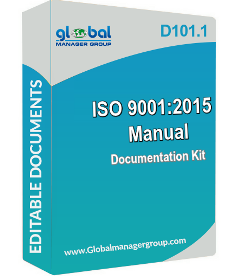 Global Manager Group, industry leader for online documents selling for various international system certifications has released new product D101.1 - ISO 9001 Manual Kit for Quality Management System as per ISO 9001:2015 requirements. ISO 9001 manual is designed to implement better quality management system and accelerates documentation processes. ISO 9001 manual is a set of editable manual documents. It will be very much helpful to organisations to improve their quality, sustainability and operational performance. The ISO 9001 manual is very useful for customers who are interested in buying part of content of ISO 9001:2015 documents kit, which covers Quality manual, procedures, SOP, audit checklist, etc. for the ISO 9001 certification of the quality system. This ready to use ISO 9001: 2015 manual will save their time in preparing the manual for their business. The user can modify the models according to their industry needs and create their own manual of the quality of organisation management system. The ISO 9001:2015 manual kit provides more clarity and includes list of documents like glossary of terms, company activity and process flow chart, organisation structure, company profile, control and distribution, sample quality policy, objectives and scope of quality management system, macro level documented information for how the QMS is implemented, etc. The complete set of documents for manual provided are editable and users allowed adding their company name and logo and making the QMS manual ready for their organisations. GMG offers Free Demo of product which can download and users can purchase full documentation kit at very compatible cost of just USD 120, which gives them a set of word documents, written in simple English with all editing and reusing rights for individual or organisation. Address: 4, Abhishree Corporate Park, ISKCON - Ambli Road, Ambli.